Review: Sunwatchers, 'II' The psychedelic ensemble's new album is a potent brew of free jazz, droning Thai melodies, minimalism and mutant funk. The psych ensemble's LP channels free jazz, Thai folk melodies and mutant funk. Note: NPR's First Listen audio comes down after the album is released. However, you can still listen with the Spotify or Apple Music playlist at the bottom of the page. II is out now (iTunes, Amazon, Trouble In Mind). When you live with music long enough, the lessons you learn take on different characters. How you experience the lyrics of Neil Young's "Don't Let It Bring You Down" as a 20-something can be profoundly different decades later. The true is same of challenging, instrumental music. The ferocious free jazz and raw, unwinding compositions of saxophonist Albert Ayler were an inspiration to Dark Meat over a decade ago. In numbers that sometimes swelled to 18 members, the Athens, Ga.-based band applied Ayler-ian noise to Southern rock in a manic carnival atmosphere. Having witnessed the spectacle myself back in the day, it was fun and weird and occasionally debaucherous, but Dark Meat was only scratching the surface of what made Ayler so pivotal. Brooklyn's Sunwatchers features three former members of Dark Meat (Jim McHugh on assorted guitars, Jeff Tobias on saxophones and keyboards, and drummer Jason Robira) plus bassist Peter Kerlin, who often plays in Chris Forsyth & The Solar Motel Band. In four years, they've quickly ascended to a paramount of psychedelic music, a brew potent with free jazz, gonzo rock, droning Thai folk melodies, minimalism and mutant funk. Since they've made New York their home, members have been the backing band for saxophonist Arthur Doyle, and have a double album on the way with guitar madman Eugene Chadbourne. They also combine with other Brooklyn experimental musicians in Drunk Foreigner Band, a passion project that pays electric tribute to the music of Thailand and Laos. These worlds align as II, the second album by Sunwatchers. "Nose Beers" announces its Thais (sorry) to the debut, a rollicking melody played on the electric phin, underpinned by a swinging rhythm section. But as Tobias bounces on the keys like one of John Cale and Terry Riley's Church of Anthrax jams and overdubbed horns refract the melody with frontline force, it becomes clear that the band has locked into another dimension. Both "The Hot Eye" and "The Works" display a clear understanding of Rhys Chatham's guitar maximalism (masqued as minimalism), weaving wurlitzers and saxophones in and out of repetitive strums of distorted guitar. The tracks take their time to establish ecstatic drones of their own — the former a trebly wash, the latter locking into a motorik groove — and pay off in euphoric squalls. Sunwatchers lift up Albert Ayler's affirmative and prophetic notion that music is the healing force of the universe. "We believe this and preach this and do what we can to live this," the band writes in a lengthy manifesto included with the album. 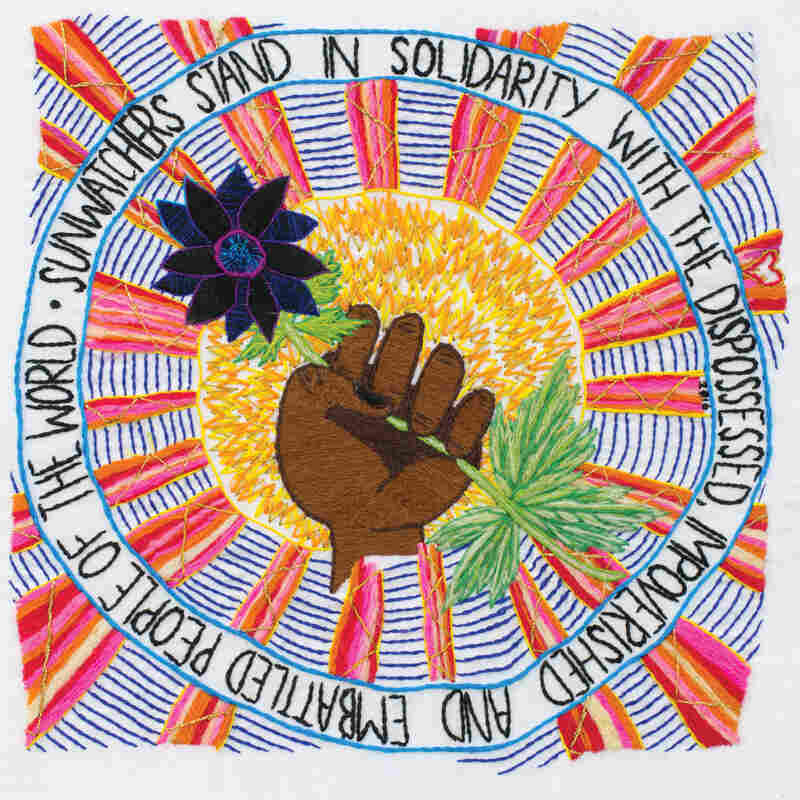 Like the song that bears the phrase, the members of Sunwatchers see a broken system and are determined to use their wild, fun and howling music to "stand in solidarity with the dispossessed, impoverished and embattled people of the world," as embroidered on the album's cover. The band are outspoken activists and proceeds of the album do go to prison reform, but the instrumental compositions speak just as loud. Listen close enough to "There Are Weapons You Can Bring To School" and you'll hear a love cry in the lingering moments between the mournful melody and cymbal crashes, the drone acting as a desperate ellipses. II closes with "Flowers of the Water (For Lou)," a martial hymn that slowly builds like Godspeed You! Black Emperor found its way into a gospel service, with a wordless melody sung by Brigid Dawson (Thee Oh Sees). This is where Sunwatchers digs into a righteous and raucous fervor, knowing that before you can heal a universe, we must heal ourselves.